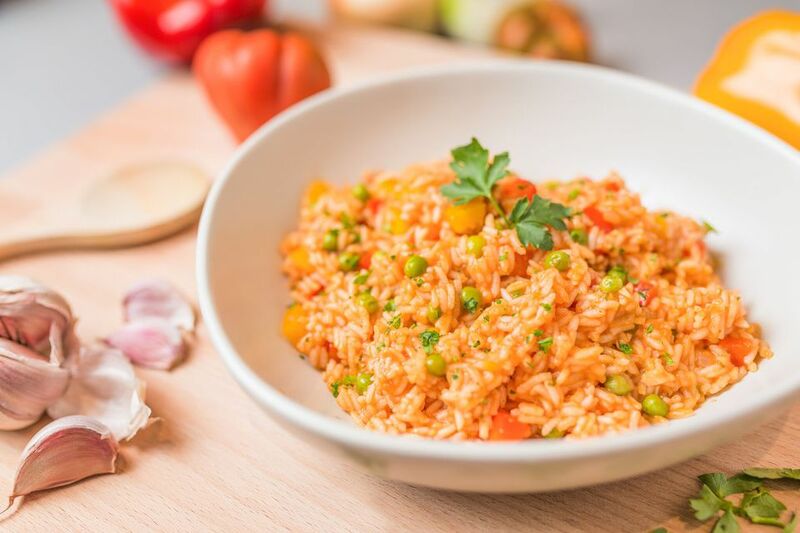 With this recipe, you will make rice similar to that served at Tex-Mex and Mexican restaurants in the United States (what you will often see on a menu as Spanish rice). It's a version of the traditional and ubiquitous red rice with vegetables prepared all over Mexico. It’s easy to make and substitutions are simple if you don’t have all of the exact ingredients listed on hand (see notes at end of recipe). In a medium-sized saucepan, heat oil over medium heat. Add the fresh onion and sauté for 1 or 2 minutes until softened and translucent. Add the garlic to the rice and sauté for one more minute. Take pan off the heat; add the chicken broth and tomato sauce, plus the parsley and/or vegetables, if using. Stir, return pan to heat and bring to a boil. Turn the heat to low and cover. Let simmer for 20 minutes without taking the lid off. After 20 minutes, remove the lid and carefully insert a spoon into the cooked rice. If the bottom of the pan is dry, your rice is done; if there is still some broth visible, allow it to cook for a few more minutes. Once rice is done cooking, remove it from the heat and let it sit, covered and undisturbed, for another 10 minutes or so. Fluff your rice with a fork before serving. Use your delicious homemade rice as a side for almost any savory Mexican dish. Store leftovers in the fridge; reheat in microwave before using. The tomato puree can be homemade or canned tomato sauce. Other forms of canned tomatoes will also work well. Canned chopped tomatoes with chiles or a jarred salsa can also be used. For additional flavor, use a good quality pork lard instead of the vegetable oil. What's the Difference Between a Sandwich and a Bocadillo? How Do You Make a Classic Spanish Sofrito Sauce? What Are Angulas and Why Are They so Expensive? What Does it Mean When Something Is Cooked 'a la Plancha'?